Orkney-based ultra marathon runner, William Sichel set about the over-60s age group endurance running records during the “Across the Years” 6 Day road race in Phoenix, Arizona which ran from December 28th – January 3rd. William’s final tally, in this race, was 17 records including the coveted World 6 Day over 60 Age-Group Record which William was able to break by over 34 miles. This takes William’s lifetime total record tally to 94. Coming in 4th overall (first in age group) William covered a total of 472.41 miles, having been narrowly pipped for 3rd place by Ed Ettinghausen on 476.61 miles. As expected, the weather conditions were of two extremes with the burning hot Arizona sun during the day, followed by a dramatic fall in temperature after sunset with minus 2 deg C being the lowest recorded during the race. The main surprise was the rough surface on the course which presented many problems to the 300 plus runners in the four concurrent events. Clouds of fine dust, sharp gravel, and uneven ground aren’t usual in road races and foot problems were everywhere. William fell heavily at one point but got away with grazes and bruising. William would like to thank Alan Young for traveling to Phoenix with him to act as support crew and to Shaun Brassfield-Thorpe for updating his blog during the race. 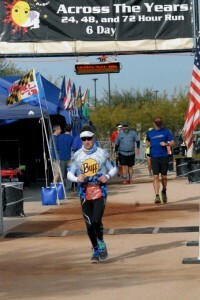 William is just starting Project165.com in which he will attempt to have set 165 ultra running records before his 65th birthday on October 1st 2018. Amongst William’s current records he holds eight world age-group records including the fastest time to run 1000 miles. William is grateful to main sponsors Orkney Micro Renewables and the Orkney Islands Council. William is dedicating Project165.com to raise funds for CLAN Cancer Support and his dedicated web page can be found below. Also traveling to the American South-West was Sri Chinmoy Marathon Team runner, Rasmivan Mark Collinson who ran 232.006 to take second Male and fourth overall on his debut in the 72 hour race.